Supports balanced gut flora and a healthy gastrointestinal system. Gluten and casein free. Free of common allergens. Capsules are plant based. Ultra Tested®. 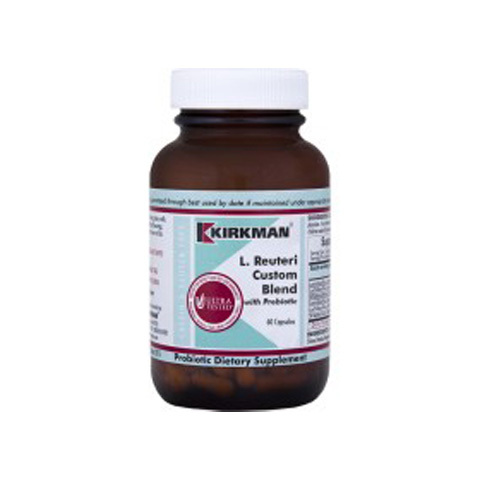 Kirkman’s new L. Reuteri Custom Blend with Prebiotic (#0541-060), contains seven billion CFUs of Lactobacillus reuteri (L. Reuteri), and one billion each of three other Lactobacillus strains (plantarum, acidophilus and rhamnosus), which are added to aid in adherence in the gut. A prebiotic fiber is also present to support the development of good gut flora by supplying a good food source for the organisms. 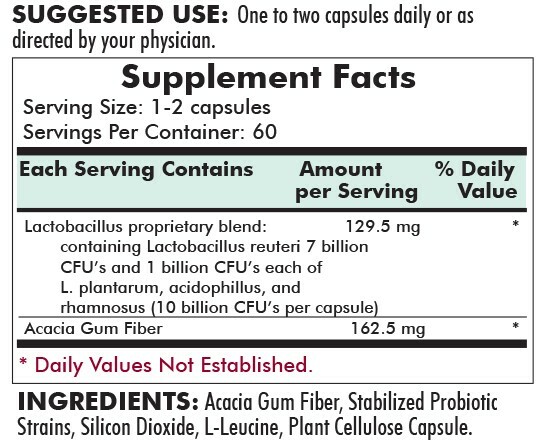 L.. reuteri is a probiotic strain that is known to support the immune system and dental health. Researchers have also found that L. reuteri plays a role in the gut-brain connection. The gut-brain connection has been established for years and postulates that the condition of the gut and presence of certain types of gut flora have an effect on neurodevelopmental behavior.